After a year, keyboard wizard Erik de Beer and his band release a new album, this time dedicated to the valiant people of Armenia who suffered one of the most criminal massacres in hands of the Ottoman government of the Young Turks. This holocaust also called Medz Yeghern (Great Crime) ended with the deportation and death of an undetermined number of Armenian civilians calculated between 1.5 and 2 million. But to make it worst and due to the continuous denial of Turkey only 20 nations and 42 USA states have accepted to consider this massacre as a genocide, so this album is a tribute for victims that have been forgotten for almost a century. But we are here to talk of music, so after this short introduction, let's return to the album. Armenia is opened by the vibrant New Flight, a song that reminds me of ELP due to the fantastic keyboard pyrotechnics of Erik, but this time well supported by the strong vocals of Marion Brinkman who adds a jazzy touch. A breathtaking start for a great album. Let Your Outside Show Me marks a dramatic contrast, this time the use of piano and acoustic guitar combined with a beautiful melody serve as a relax for the audience after the frenetic opener. The band is impeccable, but again I have to focus in Marion Brinkman, who demonstrates her versatility adding a sweet touch to enhance the music. Another Deadline starts as pure rock with a brilliant Ludo de Murlanos in the percussion, but as the song progresses, the radical changes begin and Erik takes a more preeminent role with the keys. After this, you can expect anything with pompous and brilliant Moog passages interrupted by soft melodic sections. I could go song by song, but would take hours, because I don't find a weak moment, so I will pass directly to the 'Piece of Resistance''The Armenia Suite, not without mentioning the incredibly beautiful Moment where the combination of acoustic guitars and keys, makes it memorable. 2.- - Deir Ez Zor (The March) is so soft and sentimental that almost breaks my heart, but of course some strong dramatic moments reminds us of the terrible massacre. This time Marion Brinkman returns to her uncommon style that always puzzles me. 3.- Exile (Hope) continues in the vein of the previous, allowing the piano and vocals to replace the synths , again dramatic and heartbreaking. 4.- The album is closed by Jerevan (Resurrection), theperfect finale for an excellent album, everything a Proghead wants to listen is here. I must admit that I'm a fan of the band, so it's hard to rate the album without looking as a fanboy, but honestly I believe this is the best LIFE LINE PROJECT release, or at least in the level of Distorted Memories, which I considered a 5 stars work, so I will have to go with the same rating. The massacre of over a million Armenians during World War One is the main subject of the new album by the Dutch Life Line Project. Still officially denied by the larger part of the world, Life Line Project wish to denounce this terrible and shameful page of the history of humanity and therefore they have dedicated their ninth album to the people of Armenia. As you may expect, the main title, the four part suite, entitled "Armenia" deals with this genocide. The Suite opens with the beautiful and touching main theme, played on the Grand piano. The first part is entirely instrumental and displays lots of beautiful and melodic themes with a main role for the keyboards (here lots of Moogs & Hammond can be enjoyed). The gloomy mood dominates part one of the suite. The darkest and most sombre part however, is part two, in which the story of the endless march towards death (in the Syrian city of Deir-Ez-Zor) is painfully described, both in words and music. The second part of this suite is a perfectly crafted piece of symphonic rock, with oppressive dissonants in the vocal parts, culminating in a dark march, played on several drums with again dissonant mellotron chords hovering above. This part also has beautiful and more warm sounding themes, because hope is never abandoned. Part 3 is an acoustic little gem, played by the oboe and piano only, affectingly sung by Marion Brinkman. Here the hope of a ressurrection of the Armenian people in a new state is expressed. The suite (and the album) concludes with an exultant and jubilant finale in which the Moogs of keyboard player Erik de Beer are celebrating the rebirth of the Armenian people in virtuoso and melodic solos over a solid rhythm section. The suite concludes with the main theme, again played on a lonesome Grand piano. The rest of the album consists of well-conceived symphonic rock songs, all armed with beautiful guitar-leads and perfectly executed keyboard parts. The oboe and flute, combined with the many acoustic plucked instruments (lute, chitarrone, mandolin, 12 string guitar and so on) add to the warmth of the Life Line Project sound. I very much liked the French sung "Dans le Ciel", which alternates beautiful acoustic passages with massive sounding symphonic themes. We are dealing with a lowbudget production here, so the sound might have been thicker, but the transparency of the recording makes you aware of every instrument and every detail played. In fact, this is one of my favourite albums of 2013! Real drums! No triggered samples, no electronic sounds, that's one of the first things that catches the ear when listening to Life Line Project's Ninth. It put me right back to the time of the great Keith Moon (my all time favourite drummer) and his almost uncontrolled but brilliant drumming. I don't know if it will please everyone, because it shows all irregularities of the sounds of acoustic drums in a time in which digital polishing and smoothing of sounds seems to be demanded by listeners. Great part of the music on Armenia however puts you right back in the seventies with huge analogue synth parts and roaring Hammonds, vintage guitars & all sorts of acoustic instruments, not in the least the distinctive woodwind section, consisting of flute, oboe & clarinet. The first song, "New Flight" is dedicated to the memory of Jon Lord and shows us a Marshall distorted roaring Hammond. I liked a lot the part in which Maron Brinkman sings the blues only accompanied by a hi-hat and some lower Hammond outbursts. "Another Deadline" shows us an unchained Ludo de Murlanos on drums, infallibly following all riffs and lead on both guitars and keyboards, all played by Erik de Beer. The only weak spot on the album, in my ears, is the short track "Injustice", which has more of an eighties feel, although I liked the Moog part in the middle. "Dans Le Ciel" with French lyrics was composed in 1975 and indeed it puts you right back to the glory days of progressive rock. Main title on the album is of course the 4 part suite ARMENIA, dealing with the terrible massacre the Armenians had to suffer during and short after World War One by the hands of the Turks. A genocide up to now never officially recognized, but which cost the lives of over one and a half million people. The music is great. An important role is filled by the grand piano, which both opens and closes the suite with a theme, that returns throughout the complete suite. The mood of the piece is often very oppressing and depressive. The March to Deir Ez Zor sounds cold and heartless with a stone cold mellotron and guitars, that seem to cry and just when despair grabs you, a mild and hope evoking gentle theme on piano and Moog brings relief. The third part, fully acoustic with only oboe, piano and a sensitive singing Marion, expresses the hope, that one day all will be better again, one of the most beautiful parts on the album, right before the exuberant finale Jerevan an almost Triumvirat-like finale with jubilant singing Moog leads over a super solid rhythm section. This album, which is a tribute to one of those horrible events, history tries to deny and forget, is probably Life Line Project's best album. The music sounds mature, the playing is great and Marion is at her best. If you don't mind a sound, that is so close to the seventies, you should try out this one! Whistler. The latest LIFE LINE PROJECT album is dealing with a very dramatic event, the mass killing of more than one million Armenians, almost hundred years ago in Turkey, during World War I. No surprise, that the music in the four part suite "Armenia", that concludes the album, sounds dramatic and desperate at some spots. Dramatic climax of the suite is part two "The March to Deir-Ez-Zor", a march during which so many perish and at the end of which the Armenians are exterminated like animals. The march, played with several snare drums and with very dissonant mellotron chords sounds chilling. Marion Brinkman is singing this one so great and makes you feel the tragedy and disaster. Still, there are so many beautiful and fantastic symphonic themes to enjoy, especially because feelings of hope and faith, that things may get better, are expressed in the music as well. The last part, describing the resurrection "Jerevan" gives us a jubilant Moog lead, which makes the heart of a true ELP-fan (like I am) go faster. The album starts with 8 shorter compositions, all full of solid symphonic progressive themes. "Dans Le Ciel" (written in 1975) and "Let Your Outside Show Me" are two of my favourites. "Another Deadline" shows us the more virtuoso side of LLP with an unleashed Ludo de Murlanos on drums and some great guitar solos and some incredible Hammond & Moog solos by Erik de Beer. As always with LLP the woodwinds (flute, oboe & clarinet) are a welcome embellishment of the band sound! Another great progalbum, heavily damaged by the purplefloydfish, waeguk, daemacho, evolver and marfish lot. In my opinion it takes lots of courage in these days to mention the genocide of over one and a half million Christians by the hands of an islamitic state. Today we have the sad tale of the Jazidi people in Iraq, murdered and persecuted by the henchman of IS, so I think nothing has been learned from the tragedy suffered by the Armenian people by the hands of the Young Turk government now almost 100 years ago. Life Line Project have perfectly succeeded in capturing the desolation and sadness of this tragic event. The themes chosen are all suffused with feelings of melancholy and abandon. At the same time feelings of hope and resurrection are evoked. The deepest night is reached in "The March" with hammering drums accompanying a desolate and very dissonant mellotron theme, ending in a simple piano chord evoking resignation and hope. The vocals, by Marion Brinkman, are also well-chosen and sung emotionally, but introverted. Probably the most captivating song is "Exile" in which hope is expressed, sung simply but so beautifully over the accompaniment of a grand piano only. A new hope and a new existence are evoked in "Jerevan", a grand finale, full of jubilant keyboards. The other compositions are all a welcome addition to the main composition. They all show the same warmth and emotion of both the music and the vocals. "Let Your OUtside Show Me" and the beautiful introverted "Moment" are masterpieces. One can only hope, that the future will give us more peace and less hatred and murdering, but the present time makes my heart shrink and fill with fear of the future. It seems the world is getting madder every day. 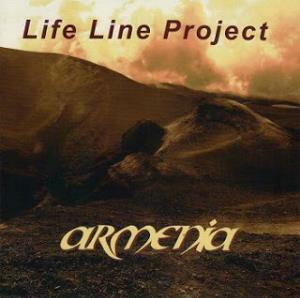 Meanwhile Life Line Project have delivered with "Armenia" a magnificent piece of progressive rock. It is now exactly one hundred years ago, since the horrible massacre of more than one and a half million Armenians by the regime of the Young Turks during World War I. Still the Turks have so much trouble in recognizing it as a genocide, but how would you call leading away an entire population in order to kill it, other than a genocide. Why do the Turks still have to defend this wrong and why not call heroes those Turks, who risked their lives by trying to rescue Armenian refugees and who were often hung in front of their houses, when discovered. The Armenia Suite on the album Armenia gives a touching and dramatic musical impression of this horrible event. After a beautiful overture in which the main theme is launched, the impressive march to Deir Ez Zor, the place where so many Armenians left their lives, follows. It starts with a tender melancholic melody on the flute, reminding us a bit of the Armenian duduk, then follows the vocal part, so well sung by Marion Brinkman. The vocal melody starts warm and tender, but becomes more harsh and dissonant in the harmonies as the march proceeds. A violent and fierce part follows and leads us to the theme of the actual march, a cruel but solemn sounding dissonant theme performed on the mellotron, accompanied by several snare drums, discharging in a sad and nostalgic reflective part in which hatred and acceptance of the events are united, an impressive symphonic work. A very restrained, but beautiful part follows, performed by the oboe and piano alone, over which Marion sings of the hope of a new dawn in which the Armenian people can once more resurrect and find happiness. The 22 minutes lasting suite ends with a stormy and pulsating finale with a jubilant Moog expressing the will and force to overcome death and defeat, a brilliant conclusion of a true magnum opus. The other compositions on the album get a bit overlooked by the impact of the Armenia Suite, but compositions like "Dans Le Ciel", sung in French (with a tad bit of Dutch accent) and the heavy "Another Deadline" and of course the Jon Lord tribute song "New Flight" with its heavy distorted organ sound are certainly worthy of being on the same album.